I’ve said this before but I think it’s important to say it again. There is a paradox of sorts in these First World War films. They’re films that have been produced to entertain us whilst telling a story of abject suffering. The real life stories they portray or imitate are the personal stories of any one of the millions of soldiers who died or suffered on the battlefields and various theatres of war. But they do entertain and the one piece of solace is that the entertainment comes with a message attached. 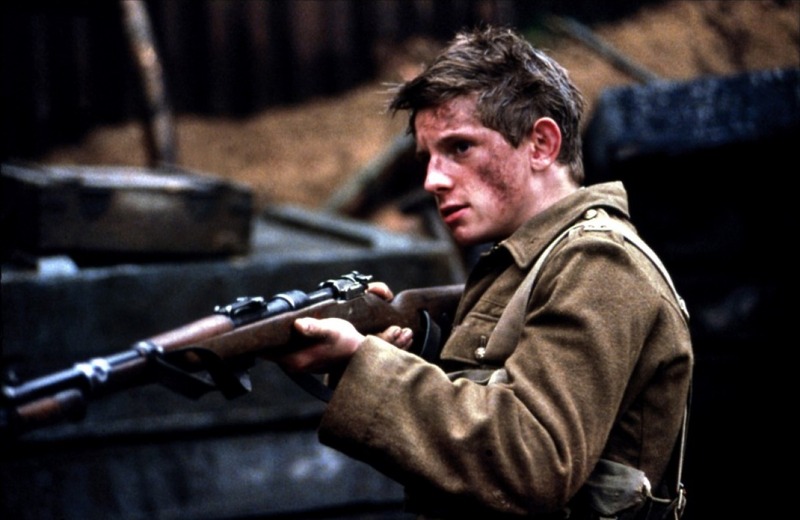 I have no problem with deriving enjoyment from watching Great War Films because they generally act to remind us of the misery those who were there coped with and, just maybe, they’ll help to stop these things from ever happening again. As a result of this there is a large weight of expectation placed on the shoulders of these Great War Films. They have an important job to do. They have to ensure we don’t forget. Film is a great medium for this when it’s done well and in the vast majority of cases it’s done well enough to at least not draw attention to itself. I don’t care too much for historical accuracy when the story is the important thing, but I think it’s important to have some respect for the subject matter overall. My film today was on to a bit of a loser in my book even before I’d first watched it. It’s a horror you see and I’m not a big horror fan, I’m not a scaredy cat or anything, I just tend to find these things massively formulaic and unengaging. As I stare slightly incredulously at the DVD case of Deathwatch I feel a question forming in my head. The question (rhetorical in nature and addressed to the heavens) is, is there really a need for a horror film based in the trenches when the real-life story of trench warfare is an abject horror show in its own right? Good question, I guess I’m about to find out the answer. 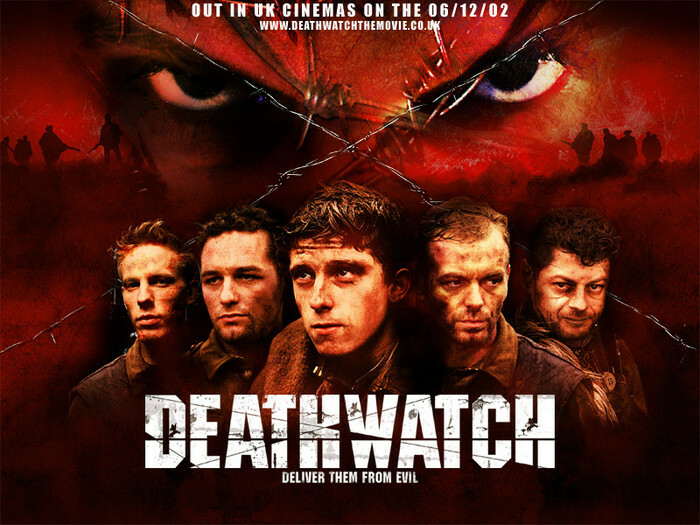 The other actors I recognised are Billy Elliot in a non-dancing role playing a scared sixteen year old who eventually grows a pair of balls, the gimp from My Family and the BT ads whose best scene involves him masturbating in the rain before getting barbed wired to death and Kev Ball from Shameless (the UK version). I think it’s clear I didn’t think too much of Deathwatch. The plot has been stolen wholesale from The Lost Patrol (or any one of hundred variants thereof) the characters spend the whole movie shouting at each other and it’s also shot really dark. I guess that was intentional and probably adds to the grimness but it just meant that even with the contrast up and the curtains pulled I had no idea what was going on. As I’ve said I’m no horror fan but surely it’s important to see what’s happening. They trot out the standard horror motifs. Blood pouring from the trench walls, a spinning compass, a character turning his back on a potentially dangerous dark corner, no communication with the outside world etc etc. Yawn. I was not scared for one instant throughout the whole thing. Towards the end they try to make the point that the evil presence in the trench is their inhumanity to one another which could’ve had legs until they seem to forget about it and start being nasty again. I also spotted little references to other films. Whether this has been done as a sign of respect or they just stole the ideas to pad out the length of the film is up for debate. There’s a bit where a guy gets sucked underground which is very much like ‘Tremors’ and then there’s a bit with a small Sarlac Pit from ‘Star Wars’ and then instantly after that it goes all ‘A Christmas Carol’ with a scene where the last survivor sees his comrades all happy and chatting with each other like when Ebeneezer Scrooge is shown a happy family scene by the Ghost of Christmas Present (past? Future? I can’t remember). The whole film is a bit all over the place but I suppose the worst thing is that it just wasn’t scary. It’s grim and dirty looking but not in any way scary. I think the writers also struggled with a meaningful ending with all these odd shenanigans going on and what they settled on was just rubbish. I shan’t ruin it for you if you should want to watch it but suffice to say it doesn’t make sense or add any twist to the threadbare story. I can’t see it appealing to horror fans, it shouldn’t appeal to Great War enthusiasts and I didn’t enjoy any of it (except Andy Serkis). So I’ve hit a new low. That is the worst Great War Film I have seen so far, hopefully the worst ever. It’s left me slightly grumpy. Think I’m going to watch an episode of Magnum PI to cheer myself up. Don’t Clicky Clicky unless you really have to. I remember quite liking it when I saw it in the cinema, but I would not describe it as being in any way essential. I like good horror films in general and do not have a problem with the First World War (or any war) being used as a setting for one, so I would have been more favourably disposed towards it. The fact that I cannot really remember anything about it (bar a particularly horrible scene with rats) suggests that it really is not that great.